In a medium bowl, mix first six ingredients until combined. Fold in chocolate chips. Cover and refrigerate at least 2 hours. To create the garnish, place your semi-sweet chocolate in a microwave safe bowl and heat 30 seconds at a time until melted and smooth. Dip half of each cannoli shell in the melted chocolate and then immediately roll in chopped pistachios. Place shells on wax paper until hardened. Once hardened, break shells into small pieces. Follow directions on the store-bought cake mix to create desired number of cupcakes. 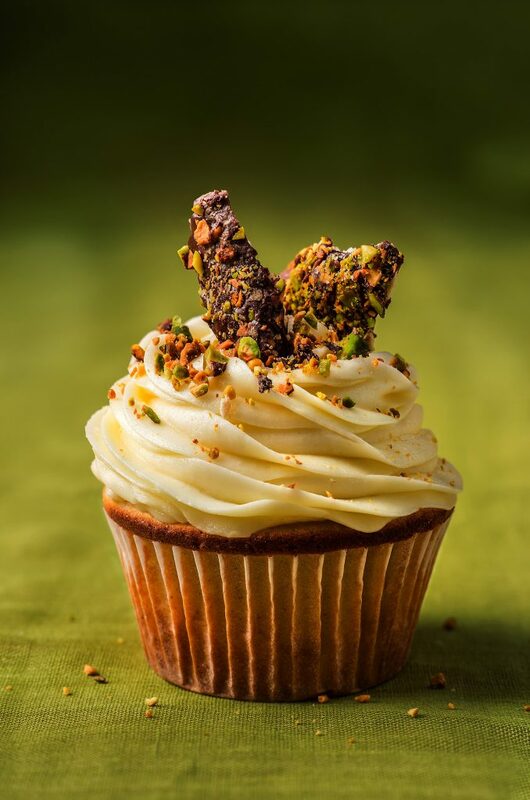 Once cupcakes are done, use a sharp paring knife to cut a cone-shaped hole in the center of each cupcake. Discard cones (or save for snacking later). Spoon your chocolate chip filling into the hole. Fill a piping bag with your frosting and start at the outer edge of the cupcake and swirl frosting in a circular motion to the center, covering the cop of the cupcake completely.